Selecting just five films of the thousands I have watched and of the hundreds I have loved is a daunting task. That’s why I should probably start by saying that the titles I have chosen here are not the same they would have been two weeks ago, nor what I would pick in a month. The only constant on such a list would probably be Hitchcock’s movies. I also have to add that when Nicole approached me for this feature, she specified that she would like me to talk about five favourite classic movies. It is true that it is classic cinema that sparked my love for movies, but it is also true that, in time, I have come to realise that there are still plenty of good and great films being made, some of them holding all the qualities to be considered classics. So I have taken this aspect into consideration as well. Rear Window may arguably be Hitchcock’s best film (Truffaut certainly thought so, alongside Notorious) and it’s my own favourite, I guess, but North by Northwest is the one I watch most frequently. It’s one of my feel-good movies. It’s a magnificent thriller, but it’s also very funny, and that’s what I love the most about it. Roger O. Thornhill is the first film character name that has remained ingrained in my memory. Cary Grant has the wit and the looks. He wittily delivers his lines while wearing his grey suit like natural skin throughout his lusty encounters with Eva Marie Saint, a crop-duster plane chase and a fight on Mount Rushmore. The film belongs to him. It is all very entertaining to watch. There is no better film to watch on a hot summer night than Rear Window. It’s both the row of events and the summer heatwave that make James Stewart edgy, and he transmits it to you too. It’s a perfect blend of thriller (like that scene of perfect suspense when Grace Kelly’s character sneaks into Thorwald’s apartment while he’s momentarily out, and James Stewart powerlessly watches from afar with mounting anxiety, making you jumpy in your own seat), voyeuristic mystery, romance, style, technical mastermind and sharp humour (the priceless silent looks between Jeff and his friend when the latter spots Lisa’s belongings when she is planning to spend the night, or Thelma Ritter’s quippy remarks every time she is on screen) – Hitchcock style. It is incredible how a movie confined to a room – one inside a Hollywood studio, no less – has the ability to give you such a powerful sense of the intoxicating, loud, breathless atmosphere of the city of New York. There is a sensibility to Japanese cinema that you will not encounter anywhere else in the world. And the most humanistic of styles you will find in the films of Yasujirō Ozu, one of the finest filmmakers that ever lived. Ozu’s prominent theme is family life, especially the destructive effects of modernisation on the Japanese family. His films are visually very simple, but in only two lines of dialogue, he can show us how the generations have drifted apart. More than that, sometimes his characters speak little and imply much: the desperately polite smile and the dignity of the incomparable Setsuko Hara in Tokyo Story are heart-wrenching; and the way the old father, the great Chishū Ryū, often gently smiles and says “yes” is heart-wrenching, too, because his yes becomes the most nuanced words in the Japanese language, quietly meaning so many different things and emotions. There is human feeling that Ozu’s movies transmit; you live the emotions of his characters, because they are instantly comprehensible. To sense this kind of affection during every single shot of a movie is something very rare. I am an optimistic by nature. But I hate forced happy endings. Maybe that’s why film noir is my favourite genre. I regard it as a prime contributor to restoring the balance disrupted by the traditional notion of the Hollywoodian happy ending. 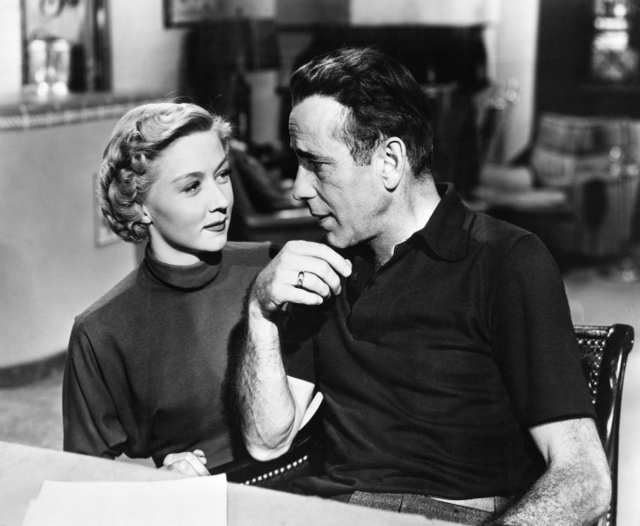 In A Lonely Place is my favourite noir (but also a very strong, amazing film), a bleak view on Hollywood and what’s happening to the people in the movie business backstage. And what an ending it has! On top of that, it features Humphrey Bogart and Gloria Grahame in their best performances. “She’s not coy or cute or corny. She’s a good guy, I’m glad she’s on my side,” says Bogart. Now that’s a compliment I’d take any day. If there is one film genre to which the phrase “they don’t make them as they used to” best applies, it would be comedies. They are probably the second type of movie I prefer, and they are so often underrated. I have resumed to a less obvious one, and certainly something most unusual for Ingmar Bergman. Smiles of A Summer Night is a perfect comedy. At times screwball, it is more conclusively the kind of comedy that artfully uses verbal wit and innuendo, and it does it to hilarious effects, and that is something that very few, even classic ones, have attempted and succeeded on screen. What happens during the course of one of those endless northern days where night is but a thin line between one day and the next? In Bergman’s view, at least, four men and four women attempt to navigate the laws of attraction during a weekend in the country. The last great love story in cinema. Of all the films of the last two decades, it is certainly the one that has had the greatest impact on me. It was filmed in Detroit and Tangier, and both places work extremely well for the plot: a vampire romance. Tangier makes everything otherworldly and overwhelming (and the music makes it even harder to resist). And Detroit shows a consummate humanity through breathtaking shots of the urban deterioration. Immortals are depicted as supreme, literate beings (as a result of their centuries-old knowledge) - too good for the mundane, living outside of time, but also being trapped by it and having to watch over our decaying world of the 21st century. Tilda Swinton and Tom Hiddleston are so very, very, very good and I loved them so as a couple – they are very much in love, but very detached, too, in their relationship, close even when continents apart. Ada Pîrvu, 35, from Bucharest, Romania, is a business owner, author of the blog Classiq, and contributor to The Big Picture magazine.